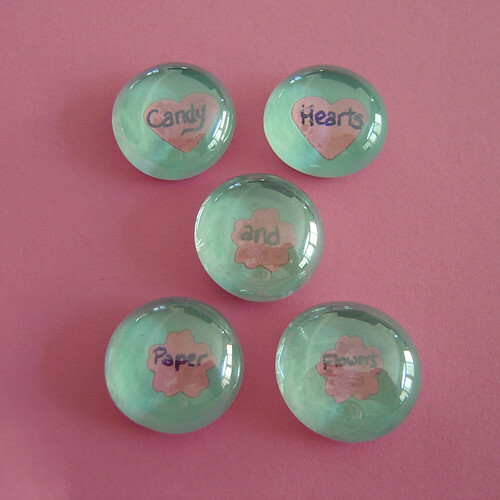 raci at Amazing Mae shared this cute Glass Marble Magnet project earlier this month. She used pretty papers and I have plenty left to do some of those as well. For now though I wanted to make a couple to send in a package to Florida to my niece and nephew. I used paper punches with cardstock for the shapes, I applied with Matte Mod Podge. 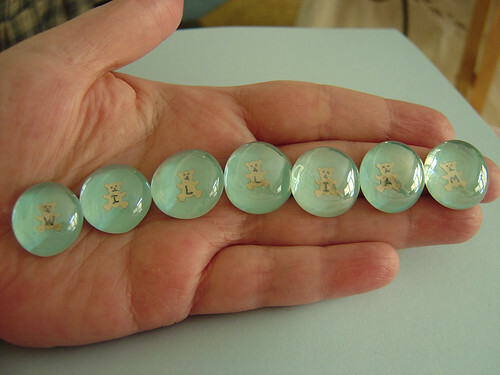 Then coated the back of the marbles with two layers of paint, an aqua with teddybears and a creamy yellow with flowers and hearts. I wanted to keep it simple to keep the focus on the shapes. I attached the magnets with Loctite Super Glue. I hope they like them. these are beautiful! what's not to like! Those are SO VERY cute. How Fun! They will love them and I KNOW you loved making them. Thanks! 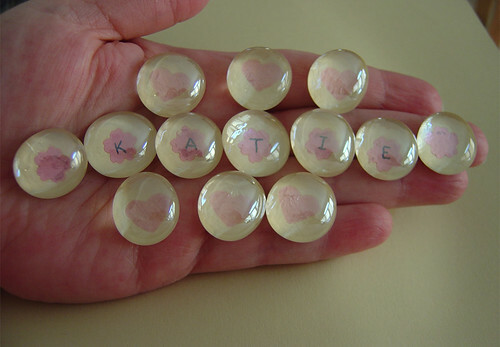 I did love making them.... :) They were so easy too. 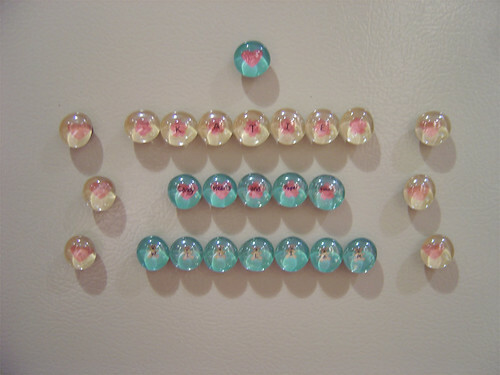 I'm thinking of trying to make a few with push-pin's for my corkboard in my office :) I'll let you know how they turn out. Oh my gosh, I MUST do this!! Thanks for sharing. This would be a fun birthday present with letters people can form their own words with. Also, thanks you for your always sweet comments at my blog! I truly appreciate you! Meredith: It was fun and didn't take too long to assemble them... I'd probably buy a punch for next time though, it took a while to get all the circles cut down to fit right on the paper ones. Love them! These would be great for my bulletin board! Wow! I've never seen anything like these. It looks like it'd be hard to work with being so small. Especially if you're like me and all thumbs and not having the best eyesight to see tiny objects! They're really cute. Nice job!